What Was Your Craziest Automotive Mishap On A Road Trip? It’s not a real road trip unless something doesn’t go as planned. Everyone has a story or two like that, including me and my brother. We were headed from Detroit to California, ready to catch some rays and get him set up for his new job. Everything was going great. The car had a fresh oil change, weather was beautiful, and we were on our way! 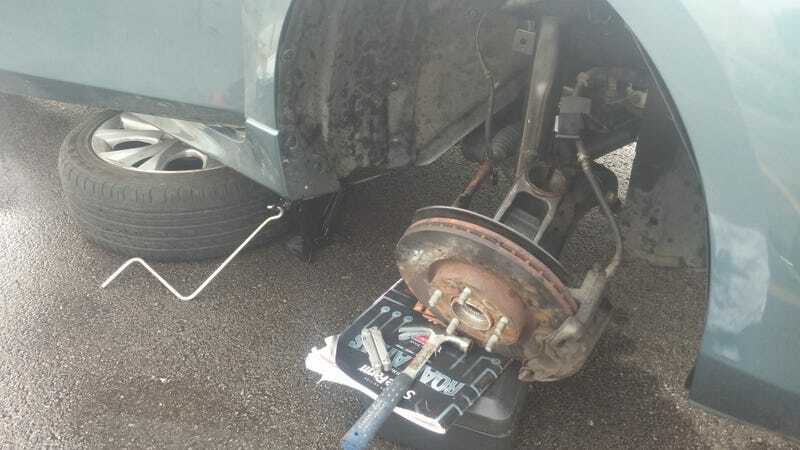 Then, near Chicago, our axle broke. And then it started raining. We called the nearest shop. They didn’t have the part. We called the dealer; they also didn’t have the part. My flight was leaving from California back to Detroit in less than two days, so we had no time to spare. So we called AAA, had them tow us to O’Reilly Auto Parts, and we started wrenching into the night. We borrowed tools from O’Reilly and started taking stuff apart. We unbolted the shock, undid the knuckle, and removed the axle. It was a tiring ordeal that took us all night, as we didn’t quite have the tools we needed. We had to improvise, as O’Reilly’s “loaner” tool set was pretty spartan. We used a hatchet to bang out our CV shaft and to get a little more force on rusty shock bolts. Sometimes our tiny hammer just wasn’t cutting it. O’Reilly ordered the part for the next morning, and we were eventually able to get back on our way after many cuts and bruises (the hatchet was a questionable decision). That was bad, you may have fared worse. So tell us: What was your worst automotive breakdown during a road trip?